Former President Benjanim Mkapa has criticised opposition leaders for claiming that the ruling party has brought no development to the country. He said their criticism was undermining the work of the founders of the nation. He wondered why such leaders were critical of CCM when many of them held high-profile positions before decamping. Speaking at a campaign rally at Tangamano grounds in Tanga on Friday, Mr Mkapa said it was disappointing to hear such claims from people who had been part of the leadership in the country’s 50 years of independence. Mr Mkapa was referring to Mr Frederick Sumaye who was the Prime Minister for 10 years in Mkapa’s government and Mr Edward Lowassa who was Premie in the first two years of Jakaya Kikwete’s presidency. “If they confess that the ruling party has done nothing in the past 50 years, what they are telling us is that they are not fit to be elected because they are part of the mess, if at all there is any,” remarked the former President. He said CCM has created a business friendly envirionment to enable those with entrepreneurial skills to get the opportunity to grow economically. Mr Mkapa said it was in that spirit entities like the Agriculture Bank, Women’s Bank and the Village Community Banks (Vicoba) have been established. He also used the campaign meeting to defend the procedure that CCM used to nominate its presidential candidate, saying it was fair. “Some have decamped to the opposition. Now, which party adheres to proper procedures? They joined the opposition in one day and on the third they got nominated. And these are the people whom you want to vote in. No thank you,” he said. He further stated that CCM was the only party that had a well prepared election manifesto. “Have you ever seen Chadema’s manifesto? Ukawa is not a party, whose manifesto are they going to implement?” he asked. 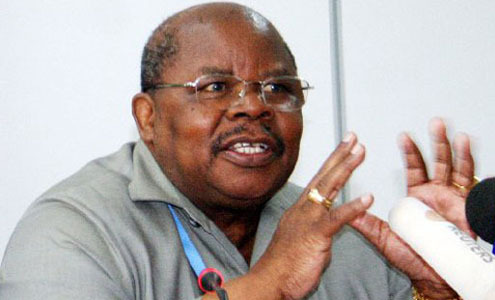 Mkapa praised CCM presidential candidate John Magufuli, saying he was the right choice because of being diligent and hardworking. “We are not electing a soccer club president, we are electing a person who will become the Commander-in-Chief of the Armed Forces,” he said.